S.V. ELARA 47 "THE PRESIDENTIAL YACHT"
We are the home to the only Presidential Yacht harbored on the Hawaiian Islands. The Elara is nimble, luxurious and was deemed fit for the President of the United States. The history of our clients is as storied as the boats themselves. If you’ve flown over 2500 miles to get to Hawaii, you are in for a world class treat for the final few miles left offshore of any of the Hawaiian islands aboard the Presidential Custom Sailing Yacht “ELARA”, the S.C. Custom Edition Beneteau Oceanis 473 SC was designed exclusively for the Sailing Club Hawaii and Hawaii Yachts clientele. She was built in Marion, SC and shipped by truck to San Diego, CA where she was custom fitted with everything from Bose Entertainment, Sattelite TV, Flat Screen Technology, and the latest in Navigational equipment for her successful maiden voyage to Hawaii (Following 18.5 days at Sea) she floated into the Hawaiian islands among a sunset of breaching dolphins and whales that welcomed her in the February of 2004. Since her maiden course for Hawaii, she has sailed all the islands extensively, often seen off the Four Seasons in Wailea, Maui or Manele Harbor, Lanai, anchored among the north cliffs of Molokai, or exploring the Kauai’s Hanalei Bay and Na Pali coast, or Sunning on the Kona Coast, she remains the pride of the Hawaii Yachts Charter Fleet. 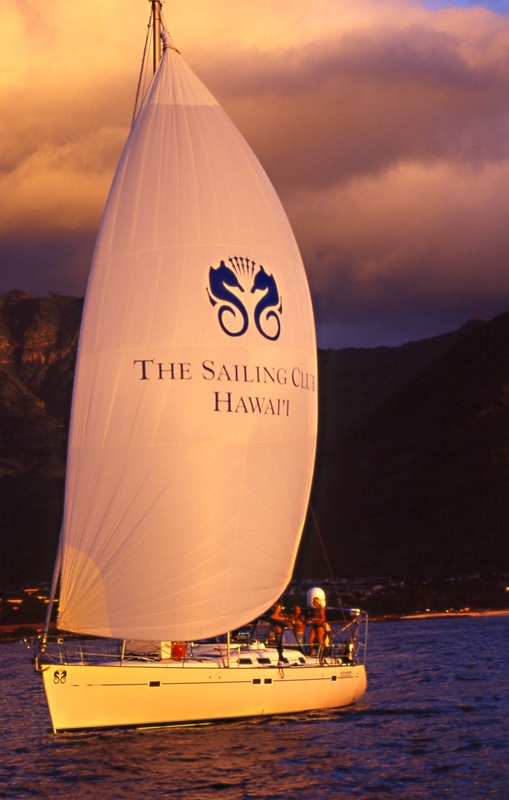 Sail Hawaii with Us, Hawaii Yachts – Unique Charters Custom to Unique Guests. The Presidential Sailing Custom Hawaii Yacht "S.V. ELARA"
Among notable actors actresses, rock legends, sports heroes, royalty and heads of state, S.V. ELARA is Hawaii’s only Presidential sailing yacht in active duty docked conveniently at the Sailing Club base minutes from Waikiki. Available for charter from any of the islands, S.V. ELARA went under a 50 thousand dollar refit in 2009, putting her in better than new condition and honoring the private guests she has hosted from around the world. For 2010 S.V. ELARA was moved to the new Hawaii Yachts / Sailing Club base at Kewalo Basin Harbor, Honolulu Hawaii, where she remains one of the most exclusive Charter yachts in the Hawaiian Islands. There are few private yachts that can claim hosting a president and their family, but fewer that have hosted as many private families in luxury befitting of our nation’s first family. Welcome Aboard S.V. ELARA a three cabin two bath yacht show wonder whose plush custom interior is an enviable escape from the world. Aboard ELARA the “good life” is an every day event, private chef using the finest and freshest of local agricultural, seafood, and sustainable products will impress all your senses with an unforgettable and memorable experience to be enjoyed privately with your loved one, friends, or family. S.V. ELARA is equipped with a tender and fishing gear to explore the most remote locations Hawaii has to offer. She is most often seen nightly sailing off of Diamond Head hosting the Captain’s Signature Sailing Club dinner sunsets when she is not on a weekly charter to the neighbor islands. No matter your event, private escape, family reunion, wedding or honeymoon at Sea, S.V. will capture the romance of an age of Aloha that we have not forgotten, but have harbored for your anticipated arrival. And be sure to contact us below by phone or through our contact form for any of your questions or requests.